Some of you know that I am a proud “Gopher” – a graduate of the University of Minnesota for my masters in mass communication. I am also a proud “Terp” – my undergraduate degree being in journalism and agriculture from another “UM” – the University of Maryland (let’s call it UMd for short). Back in October, I received an alumni update from UMd, letting us know that our alma mater was aiming to be the nation’s first “Do Good” campus, rooted in the Land Grant mission of putting knowledge into practice for social and economic betterment. I love this idea as I’ve been pegged as a “Do Gooder” more than once in my life (proud of it, too!) and now “Do Good” is a bona fide, officially-sanctioned strategy of a leading public university. I couldn’t be more proud of UMd, expanding what was a trial run in the Center for Philanthropy and Non Profit Leadership in the School of Public Policy, into system-wide values and actions aimed at ensuring every student will be informed and motivated to “do good” in their communities, both local and worldwide. And it’s not something “done unto” the students. Students want to do this. UMd is seeing a 50-year high in the percentage of students today who say that helping others is a “very important” priority. “We are met here today to discuss this portion of America [rural America] in a period when almost all of the national conscience is focused on yet another segment of land, the great cities. “It is almost as if we were two Nations; one rural, one urban, with separate problems, separate solutions, separate destinies. “But in fact – as well as in rhetoric – we are still one Nation, indivisible, with indivisible problems, indivisible solutions; with but one destiny. And unless we recognize this, we shall never overcome the terrible strains that threaten to rend the social fabric of our land. In 2016, we’ve all experienced a difficult, divisive election. And in just over one month, at the highest levels of government, we will witness not only a transfer of power, but a transfer of responsibility: a profound, solemn, and humbling responsibility. And yet, ultimately, it is “We the People of the United States” who hold the highest power and responsibility, to bridge the divides we see at every level of community, state, region, and world, step by step, person by person, to Do Good wherever we can. Let’s get to work. Help one another. Do Good in this season of giving, and for all time. –The Environmental Protection Agency is offering grants to nonprofit and public agencies for either: 1) developing inventories of brownfields, prioritizing sites, conducting community involvement activities, and conducting site assessments and cleanup planning related to brownfields sites, or 2) cleaning up contaminated brownfields sites. Deadline: 12/20/2016. Click here for program guidelines and to apply. –THE HOME DEPOT Foundation Community Impact Grants Program provides support to nonprofit organizations and public service agencies in the U.S. that are using volunteers to improve the physical health of their communities. Proposals for the following community improvement activities will be considered: repairs, refurbishments, and modifications to low-income or transitional veteran’s housing or community facilities (schools, community centers, senior centers, etc. ); weatherizing or increasing energy efficiency of low-income or transitional veteran’s housing or community facilities; engaging veterans as volunteers to help other veterans in their community through service projects focusing on the renovation, repair, and improvement of homes and other properties serving veterans; and planting trees or community gardens or landscaping community facilities that serve veterans. Requests will be accepted through 12/31/2016. Visit the Foundation’s website here to submit an online application. — KATIE’S KROPS is accepting applications for youth garden grants. Gift cards of up to $500 and other support will be awarded for youth-planted vegetable gardens created in support of local community needs. Deadline: 12/31/2016. Click here to review application guidelines. –Department of Health and Human Services is offering grants through the Rural Health Network Development Planning Grant Program. This program supports the development of integrated healthcare networks, specifically for entities that do not have a history of formal collaborative efforts. DEADLINE: 1/3/2017. Click here to review funding guidelines. — Small Rural Hospital Improvement Program (SHIP). The Office of Rural Health and Primary Care coordinates a state application to the federal Health Resources and Services Administration, Office of Rural Health Policy on behalf of Minnesota’s small rural hospitals (49 or fewer beds). The Small Rural Hospital Improvement Program (SHIP) grant funds may be used to purchase items from the SHIP Purchasing Menu in the following funding categories: value based purchasing, accountable care organization, payment bundling or care transitions. Applications are to be returned to judith.bergh@state.mn.us via email by January 8, 2017. –The National Institutes of Health is offering grants to rural nonprofit and public agencies for programs that help control the opioid epidemic in the United States. Deadline: 01/10/2017. Click here for grant materials. –THE MISSION CONTINUES is seeking applications for Post-9/11 Veteran Nonprofit Fellowships. Service fellowships, which include a cost-of-living stipend, are awarded to post-9/11 veterans to enable them to volunteer with nonprofit organizations in their community as an extension of their service to the country. Deadline: 1/17/2017. Visit the website here to review program guidelines. — THE UNFI Foundation funds nonprofit organizations across the United States that support the development of healthy, organic foods and food practices, and promote the health of the planet. The focus is on organizations that work to increase organic agriculture, provide research and science to develop organic farming practices, protect the biodiversity of our seed supply and the stewardship of genetic resources of organic seed, teach organic farming practices that promote conservation of resources, and foster the next generation of organic farmers. The first two letter of intent deadlines in 2017 are 1/19 and 4/27. Visit the Foundation’s website here to review guidelines and learn more about the application process. –BIG READ is accepting grant applications from nonprofit organizations for programs that encourage reading and participation by diverse audiences. Grants of up to $20,000 each will be awarded to nonprofit organizations for community-wide reading programs. Deadline: 1/26/2017. Click here to review program guidelines. –U.S. Environmental Protection Agency is offering grants for projects that address local environmental and public health issues within an affected community. Grants will be awarded to programs that support activities designed to empower and educate affected communities to understand environmental and public health issues and to identify ways to address these issues at the local level. Approximately 40 one-year projects will be awarded $30,000 each. Deadline: 1/31/2017. Click here to review application guidelines. –The Department of Health and Human Services is offering grant funds to CDCs for community-based efforts to improve the economic and physical health of people in areas designated as food deserts or where applicants can point to indicators of need, such as poor access to a healthy food retail outlet, a high percentage of individuals with low-income, incidence of diet-related health conditions, or high concentrations of persons eligible for food assistance programs. Through the Community Economic Development (CED) program and within the framework of the Healthy Food Financing Initiative (HFFI), the Department seeks to fund projects that implement strategies to increase healthy food access, foster self-sufficiency for individuals and families with low income, and create sustained employment opportunities in communities with low incomes. Deadline: 4/28/2017. Click here to review funding guidelines and download an application package. — Community Transportation Association of America is accepting applications for technical assistance for tribes and rural communities of less than 50,000 people to plan system start-up, transit service improvements, facility development, marketing, transportation coordination, and staff training. Deadline: applications are accepted on an ongoing basis. Click here for an application and guidelines. –The Bush Foundation offers Community Innovation Grants in Minnesota, North Dakota, South Dakota, and the 23 Native nations that share the same geography. Grant funds help communities use problem-solving processes that lead to more effective, equitable, and sustainable solutions. Grants are provided for projects that use inclusive, collaborative, and resourceful processes; are thoughtful, realistic, and address the identified community need; and are likely to make a significant, sustainable difference, now or in the future. Nonprofit organizations and government entities (including schools) may apply for grants ranging from $10,000 to $200,000. (Community Innovation Grants of $500 to $10,000 are available from the Foundation’s intermediary partner organizations.) Applications may be submitted throughout the year. Visit the Foundation’s website here to review the selection criteria and to learn more about the application process. –The Kresge Foundation is offering grants through its Arts and Culture Program to anchor institutions in any sector that have a stake in and are located in a low-income, disinvested community, and to nonprofit community partners, nonprofit artist collaboratives, and government entities. Support is provided for cross-sector/cross-disciplinary projects that embed arts and culture into local systems such as municipal departments, community financial networks, comprehensive planning efforts, human services networks, regional food hubs, etc. Deadline: online applications may be submitted throughout the year. Visit the Foundation’s website here to learn more about the Arts and Culture Program. —Automated External Defibrillator (AED) Grant Program offers grants to eligible organizations to cover all or part of the costs associated with purchasing an automated external defibrillator (AED). Applications accepted on an ongoing basis. — Registration Now Open for the 2017 Explore Minnesota Tourism Conference You are cordially invited to join us Jan. 31-Feb. 1, 2017, at the Intercontinental Hotel in St. Paul for the 2017 Explore Minnesota Tourism Conference: The Next Big Event! –SAVE THE DATE! The National Housing Conference will host “Solutions for Housing Communications 2017” will be April 27-28, 2017, in Minneapolis. — SAVE THE DATE! 2017 Nonprofit Leadership Conference to be held at the University of MN in Minneapolis on Tuesday, June 13, 2017. — Call for Proposals for the 2017 MN Rural Health Conference, June 19-20 in Duluth. If you are interested in presenting a 60-minute breakout session or facilitating a roundtable discussion at the 2017 Minnesota Rural Health Conference, Shaping Sustainable Solutions, please submit an online proposal. The deadline is December 21, 4:00 p.m. Central Time. Remember to sign up to receive conference updates. — Explore Minnesota Tourism Conference Sponsorships Now Available for the 2017 Explore Minnesota Tourism Conference that will be held Jan. 31-Feb. 1, 2017, at the InterContinental Saint Paul Riverfront in downtown St. Paul. — Submit Your Location for Possible Film, Television or Commercials Do you have a one-of-a-kind Main Street in your town, a neighborhood of beautiful homes or picturesque parks, or even spooky abandoned buildings? — Morris K Udall and Steward L Udall Foundation is offering a 10-week fully funded summer internship for Native American and Alaska Native students who wish to learn more about the federal government and issues affecting Indian country. Deadline to apply: 1/31/2017. Visit the Foundation website here for guidelines and an application. —2016‒2017 Student Essay Contest The Federal Reserve Bank of Minneapolis sponsors this contest for high school students in the Ninth Federal Reserve District. Students answer the question: “Can the U.S. economy still grow the way it once did?” to win monetary prizes. Essays are due by March 31, 2017. — Tesla Offers Chargers to Hotels and Resorts across Minnesota hoping that owners of Minnesota hotels and resorts will want to attract drivers of Tesla vehicles to their properties by joining Tesla’s destination charging network. — Roadmaps to Health Coaching offers guidance and support from a community coach for communities who want to improve the health of their populations and work toward building a culture of health. Applications accepted on an ongoing basis. Sponsored by County Health Rankings & Roadmaps and the Robert Wood Johnson Foundation. — Rural Impact County Challenge: A National Effort to Combat Rural Child Poverty The Rural Impact County Challenge will recognize and support counties making strides in reducing child poverty in rural communities. The challenge will provide educational opportunities, networking forums, and resources to develop and implement evidenced-based approaches to reduce the number of children and families living in poverty in rural areas. Applications accepted on an ongoing basis. Sponsored by the National Association of Counties. — Rural America at a Glance, 2016 Edition after declining for several years, rural population stabilized. Median annual earnings rose in rural areas and poverty fell markedly in 2015, as in urban areas; the rise in earnings occurred across most major industry sectors. Presents concepts and samples to create a development plan for measuring progress in rural wealth creation for rural development organizations (RDOs) involved in community and economic development. Specifically identifies 8 forms of capital measures useful to evaluate progress in rural wealth creation including the skills, understanding, physical health and mental wellness of the individuals within the community. — Rural Classifications ERS maintains key classifications that measure rurality and assess the economic and social diversity of rural America beyond the metro/nonmetro dichotomy. A recent addition to the suite of products for rural analysis includes data files for use with the American Community Survey’s Public Use Microdata Sample (ACS-PUMS) that identify each Public Use Microdata Area (PUMA) in the ACS-PUMS as either metro, nonmetro, or mixed, based on the metro and nonmetro population shares in each PUMA; for mixed PUMAs, the share of the population residing in a metro area is reported. — Employment & Education recent updates to this topic provide information and research findings about the well-being of rural workers and the changing structure of rural labor markets, with a focus on the period 2007-2016. Highlights include the profound effects of the 2007-09 recession, and the rate at which employment has recovered since. The labor market measures discussed include the level of employment, the employment/population ratio, the unemployment rate, and the labor force participation rate. — The Surdna Foundation has developed and published www.CommunityEngagedDesign.org, a new website that highlights written, audio, and video content regarding developments in the community engaged design field. Community engaged design (CED) is practiced when architects, designers, or urban planners work in solidarity with low-income communities and communities of color to ensure decisions made about the built environment are equitable and just. Visit the website here. — The Carsey School of Public Policy has published a brief titled “Carsey Perspectives: Bridging Farm and Table: The ‘Harvest to Market’ Innovation: Highlights from a Social Venture Innovation Challenge Winner.” Harvest to Market is a new online platform that makes it easier for small farmers to sell their products directly to local consumers. Potential customers, which can be schools, restaurants, and institutions as well as individuals, can search for nearby markets and browse through the available produce as listed by the farmers. Download the brief here. — Two New Reports Portray the State of Sustainable Tourism in Minnesota The University of Minnesota Tourism Center and Explore Minnesota have partnered four times since 2007 to survey Minnesota’s tourism industry about sustainable tourism practices. help enhance relationships between communities and health systems, public health agencies, hospitals, clinics and community-based programs. The toolkit and background resources are available on our Toolkit webpage. Funding for the creation of the toolkit was provided by the Center for Medicaid and Medicare Improvement via the Minnesota State Innovation Model (SIM) grant. Please feel free to share the CHW Toolkit with others. 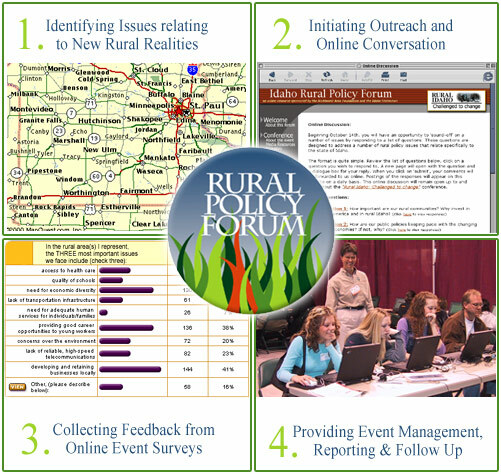 The Rural Policy Forum is a tool that allows conference planners to expand their events online. Participants (on-site and remote) are invited to share their opinions, ideas, and suggestions through online discussions and surveys. Advantage to participants: Everyone’s voice is heard and opinions are documented! Advantage to conference hosts: You can hear what everyone has to say, you can track trends, and you can open conversations that focus participants before, during, and after the event. The Rural Policy Forum process allows organizations, event organizers, and governments to engage large numbers of individuals around specific issues. The process can gather data about current conditions, practices, policies and more. Completely customizable, the integrated services are designed to work within a specific time frame and often involve a conference or other event. The technology utilized provides quick compilation of results and removes place restrictions. Throughout the process Minnesota Rural Partners works with event organizers or other stakeholders to assure that data and process expectations are met. The Rural Policy Forum process is intended to significantly advance the conversation, in the United States and worldwide, regarding rural policy. Another objective of the process is to generate a grass roots consensus on the key issues facing rural America, providing practitioners, researchers and policy makers with a road map of issues and priorities and offering political support for a position of reform. Outreach to participants is conducted through electronic and other communications (ie post-cards, event brochures, etc…) to build awareness of the discussion prior to the event and to direct persons to the web site. The online discussion period lasts for as long as a month prior to the event, providing participants time to respond and review other participant comments online. If you have an upcoming event and accompanying website, contact us to discuss how we might integrate the Rural Policy Forum components into your online presence. At least a week before the event, Minnesota Rural Partners and event organizers review the online discussion to formulate questions for an electronic survey to be accessible at the event and online for a period of time after the event. Where the ‘Online Discussion’ provides the sharing of qualitative information, the ‘Online Survey’ will provide an opportunity to gather and report on quantitative data. Most questions are multiple choice, true/false or selections from a drop-down list. Preliminary survey results will be made available at a given event. A complete report will be assembled by MRP, Inc. following the event, reflecting online survey results. (see sample survey results below). Cyber Cafe: MRP works with event organizers to set-up and staff a bank of computers with broadband Internet access at the event; a Cyber Cafe. Minnesota Rural Partners works with event organizers to build awareness among event participants and direct them to the Cyber Café and the online survey. MRP provides preliminary survey results by the end of the event and can present them to conference organizers and/or participants. Follow-up and Reporting: Minnesota Rural Partners compiles the Survey results and creates formal reports including graphical illustrations and formatting for different audiences (event participants, general population, media, and local, state and national decision-makers). The results are made available in electronic formats to all audiences and placed on the event-specific web page integrated with the ruralpolicyforum.org site. The Rural Policy Forum process partners with organizations, event organizers, media and governments to engage large numbers of individuals around specific issues. The process can gather data about current conditions, practices, policies and more. Completely customizable, the process was designed to work within a specific time frame and often involves a conference or other event. The technology utilized provides quick compilation of results and removes place restrictions. Throughout the process Minnesota Rural Partners works with event organizers or other stakeholders to assure that data and process expectations are met. Minnesota Rural Partners has compiled a list of resources (2006 MN Resource Directory) in Minnesota that support and/or promote entrepreneurs and small businesses. The Directory was originally distributed at the 2006 Symposium on Small Towns and Rural Summit. In 2000, the Minnesota Rural Entrepreneurship Academy examined Minnesota’s strategies in this arena to see if the state has the culture that supports a “cycle of entrepreneurship.” Their conclusions (2000 Minnesota Rural Entrepreneurship Academy Resport) pointed towards a need to better focus resources around four critical areas: capital, technical assistance, physical infrastructure, and culture and education. In particular there was a need to help people define the ladder of stages for entrepreneurs and small businesses and target help accordingly. In 2006, several legislators authored a bill that would have created the Minnesota Office of Entrepreneurship, to coordinate and support entrepreneurship development activities across the state. The bill (H.F. 3677) failed to pass but many people wanted to help get it passed next session, as a non-partisan effort that makes good sense for Minnesota’s economic development strategy, for rural and urban Minnesota alike. Minnesota Rural Partners sponsored an ANALYSES on the PROPOSED LEGISLATION for the MINNESOTA COUNCIL ON ENTREPRENEURSHIP (finalfeasibilitygustavus) in reaction to that legislation. This is the speech (jleonardkeynotesummit06) was given by Jane Leonard, Minnesota Rural Partners at the Symposium-Summit in 2006 at the University of Minnesota-Morris. For more than 10 years, MRP has lifted up rural people and places. We are now lifting up the ways in which rural and urban people and places help each other for the betterment of all. Dear Reader: We were happy last month to be planning for a column here by a guest columnist on a terrific information tool. We find this week, however, that we must postpone inclusion because the topic of the story – a web-based map supported by the Economic Research Service of the USDA – is not supported currently because of the Federal Government Shutdown (or should we say “showdown?”). Right now the domestic enemy is themselves (Pogo was right!). The rest of us – We the People - hope for the formation of a more perfect “Union” very soon to help us all uphold the rest of our Constitutional responsibilities. --HUD is offering grants to owners of eligible subsidized housing developments to hire staff to coordinate supportive services for elderly residents and/or residents with disabilities. Deadline: 10/14/2013. Click here for more information and to apply. --LOWE’S Toolbox for Education ® Grants support projects in the following categories: technology upgrades, tools for STEM programs, facility renovations and safety improvements. Grant requests can range from $2,000 to $100,000. Deadline: 10/15/2013. Click here to visit the website and read more about this program. It also opens the Rural Initiative grant application today, supporting participatory efforts among citizens in rural communities. Grants of up to $25,000 are given to encourage collaborative efforts that will help to strengthen rural towns and regions in a number of civic areas including, but not limited to, economic development, business preservation, arts and humanities, public space improvements, and education. Online applications will be accepted starting October 8 through November 6, 2013. Please see the Fund’s website at http://www.musserfund.org for more information. --CERTs accepting Seed Grant applications for clean energy projects. The Minnesota Clean Energy Resource Teams (CERTs) is seeking proposals for Seed Grants to support community-based energy efficiency and renewable energy projects. Funding will provide technical assistance services for projects in seven Minnesota CERTs regions: Central, Metro, Northeast, Northwest, Southeast, Southwest, and West Central. The primary objectives of the Seed Grant projects are to (1) encourage the implementation of community-based clean energy projects in Minnesota and (2) provide a forum for community education about energy efficiency and renewable energy technologies and their economic, ecological, and community benefits. Project proposals are due by Oct. 18. View more information and the full RFP. --2014 Call for Preproposals NCR-SARE Research and Education Grant Program. The North Central Region SARE (NCR-SARE) Research and Education Grant Program is a competitive grant program for researchers and educators involved in projects that explore and promote environmentally sound, profitable, and socially responsible food and/or fiber systems. The 2014 NCR-SARE Research and Education Grant Program Call for Preproposals is now available online. NCR-SARE’s Research and Education (R&E) program supports sustainable agriculture innovators with competitive research and education grants. Individual grants range from $10,000 to $200,000. NCR-SARE expects to fund about seven to ten projects in the twelve-state North Central Region. -- Free Webinar: Community Technology and Entrepreneurship Networking: October 10 from 3-4pm. A number of Minnesota communities are working to bring technologists and users of technology together to increase interaction and knowledge sharing. This webinar will highlight these examples and give tips on how to start these events in your own community. In addition, metro area technologists often participate in interactive, innovative events called hackfests. We will hear from an experienced hackfest organizer on how to bring the combined knowledge and experience of your local tech community to create local applications that benefit the community. --Upcoming Energy Savings Goals (ESG) Study Stakeholder Meetings. Legislation passed in 2013 requires the Department of Commerce http://mn.gov/commerce/energy/topics/resources/energy-legislation-initiatives/ to conduct public meetings with stakeholders that results in a legislative report with recommendations on the statewide and Conservation Improvement Program (CIP) http://mn.gov/commerce/energy/topics/conservation/ energy savings goals. Information on this legislation can be found in Minnesota Legislature House File 729 (HF729) 4th Engrossment, Article 12 Section 8. Stakeholder meetings and technical workgroups will be held in October and November at the Wilder Foundation and at the Department of Commerce. This stakeholder meeting will be moderated with presentations from industry experts and a panel discussion with representatives from different stakeholder groups. Details regarding the stakeholder meeting process and agenda will be provided prior to each of the meetings. --Rural Health Community Forums – Little Falls and Breckenridge. Join Minnesota Department of Health ORHPC in gathering information and making recommendations about rural health care in Minnesota. Interested citizens, hospital administrators and staff, emergency medical services personnel, health care providers, and community organizers and leaders are encouraged to attend one of two upcoming regional forums http://www.health.state.mn.us/divs/orhpc/forums/index.html: in Little Falls on October 28 at St. Gabriel's Hospital and in Breckenridge on October 29 at St. Francis Healthcare Campus. Your input will help shape state and national health care policies and activities. To attend, please register online. https://survey.vovici.com/se.ashx?s=56206EE355ECF878 For more information, contact Judy Bergh at 651-201-3843 or judith.bergh@state.mn.us. --Preparing Minnesota for Climate Change: A Conference on Climate Adaptation. Minnesota’s first “Conference on Climate Adaptation”, designed for Local Officials, Planners, Engineers and Natural Resource practitioners, is scheduled to take place on November 7th at the Science Museum of Minnesota. Participants will learn about other communities' early successes in developing adaptation strategies in areas such as transportation infrastructure, natural resources, human health, and agriculture. The morning and noon speakers will set the stage, and the afternoon will features breakout sessions describing successful case studies. -- Cooperatives = Community Development Conference will be held in Minneapolis on November 8th. NCDF is co-hosting a conference http://tinyurl.com/nrqgs6q on the role of cooperative businesses and housing in community and economic development. Organized by CoMInnesota, along with NCDF partners, Cooperative Development Services and Northcountry Cooperative Foundation, the day-long event at the Thrivent headquarters in downtown Minneapolis will bring together community and economic developers and cooperative developers from throughout Minnesota. * Mental Health, Climate Change, and Public Health. This training module provides an overview of the observed climate changes in Minnesota, the public health issues related to climate change and mental health, and public health strategies for reducing the negative mental health impacts of climate change. * Agriculture & Food Security. This module provides an overview of the observed climate changes in Minnesota, the potential impacts of climate change on agriculture and food security, and public health strategies to increase food security and food education. --“Community Food Enterprise: Local Success in a Global Marketplace” is a book funded by The Kellogg Foundation and The Bill and Melinda Gates Foundation. From the Executive Summary: “The local food movement is now spreading globally, yet is not well understood. To many, local food is exclusively about proximity, with discriminating consumers demanding higher-quality food grown, caught, processed, cooked, and sold by people they know and trust. But an equally important part of local food is local ownership of food businesses. This report is about the full range of locally owned businesses involved in food, whether they are small or big, whether they are primary producers or manufacturers or retailers, whether their focus is local or global markets. We call these businesses community food enterprises (CFEs).” http://communityfoodenterprise.org/book-pdfs/CFE%20Book_view.pdf. 1. Safeguarding confidential and proprietary information. 3. Compliance with securities and disclosure laws. 4. Social media as a marketing tool. 5. Influence of social media on the employment relationship. 6. Ownership of social media accounts. This book has been developed as part of DEED’s ongoing efforts to help aspiring entrepreneurs, small, and other businesses understand emerging workplace issues. The book was developed in partnership with the Minneapolis-based law firm of Gray Plant Mooty to produce the book. It is available in print or CD-ROM from DEED’s Small Business Assistance Office at 651-259-7476 or 800-310-8323 or deed.mnsbao@state.mn.us. Or requests can be mailed to the Small Business Assistance Office at First National Bank Building, 332 Minnesota St., Suite E200, St. Paul, MN 55101-1351. http://tinyurl.com/oj458bh Businesses are encouraged to check the website periodically for updates because regulations and laws continuously change. --Online Voter Registration Available. Minnesota voters can now register online to vote. In addition, military and overseas voters can apply online to receive absentee ballots. Information about both of these tools can be found at www.mnvotes.org. --Effective October 1, 2013,USDA Rural Development will be implementing the 2010 Census Data for Rural Development Housing Programs. The result of this action will be a change in the eligible areas in the State of Minnesota where the Rural Housing Service Programs can be used. You can access the proposed area eligiblilty maps at: http://eligibility.sc.egov.usda.gov/eligibility/welcomeAction.do Simply click on the link, look to the left side of the page, and click on the appropriate section that you want to review. --USDA has issued a NOFA for the Rural Community Development Initiative for qualified intermediary nonprofits to undertake projects related to housing, community facilities or community and economic development in rural areas. Deadline to apply: 11/12/2013. Click here for an application package. --USDA Rural Development’s Direct Home Repair Loan and Grant programs are designed to help eligible, low-income seniors who own inadequate but repairable housing. Qualified projects can include repairing or replacing a roof, winterizing, purchasing or repairing a heating system, structural repair, water and sewage connect fees, and similar uses. Applicants must own and occupy the home, and their income may not exceed guidelines established by county and household size. Applicants must also have an acceptable credit history, show repayment ability, be unable to afford a conventional loan and live in a community with a population of 20,000 or fewer. The maximum loan is $20,000, repayable over 20 years with a one percent interest rate. Grants of up to $7,500 are also available to homeowners over the age of 62 and must be used to remove health or safety hazards. Contact your local Rural Development office or visit Rural Development's website at www.rurdev.gov/MN to learn more about our Direct Home Repair Loan & Grant programs. Information comes from a variety of sources including the American Community Survey, Census 1990, 2000 and 2010, the Department of Labor's Quarterly Census of Employment and Wages and State Occupational Projections, and the Census Bureau's Local Employment Dynamics (LED). Data are maintained and updated by the collecting agency. To access the tool, visit http://thedataweb.rm.census.gov/TheDataWeb_HotReport2/EPA2/EPA_HomePage2.hrml. --U.S. Bioenergy Statistics are a source of information on biofuels intended to present a picture of the renewable energy industry and its relationship to agriculture. Where appropriate, data are presented in both a calendar year and the relevant marketing year timeframe to increase utility to feedstock-oriented users. The statistics highlight the factors that influence the demand for agricultural feedstocks for biofuels production; for instance, numerous tables emphasize the relationship between energy and commodity markets. --Ag and Food Statistics: Charting the Essentials ERS has compiled over 75 charts and maps covering key statistics on farming, food spending and prices, food security, rural communities, the interaction of agriculture and the environment, and more. --Projecting regional population growth of nearly 900,000 people over the next 30 years, the Metropolitan Council has taken its first cut at forecasting where that future growth is likely to occur among metro area cities and towns. Council officials say the region’s economy will remain robust, but real estate demand and development patterns will differ from previous decades. Regional forecast details. --Eating Better at School: Can New Policies Improve Children’s Food Choices? (Amber Waves feature) ERS research found that offering school lunches with a healthier mix of vegetables was associated with higher consumption of healthier vegetables, but also higher food costs. "Nudging" students can increase acceptance of healthier foods. Over the past 3 decades, U.S. crop production has been shifting to larger farms for most crops and in most States. But family farms still dominate U.S. crop production, accounting for 87 percent of the value of U.S. crop production in 2011.